I sure am looking forward to all the great food that you will be bringing today and what a great time to spend time in the country, it is actually cool in August. 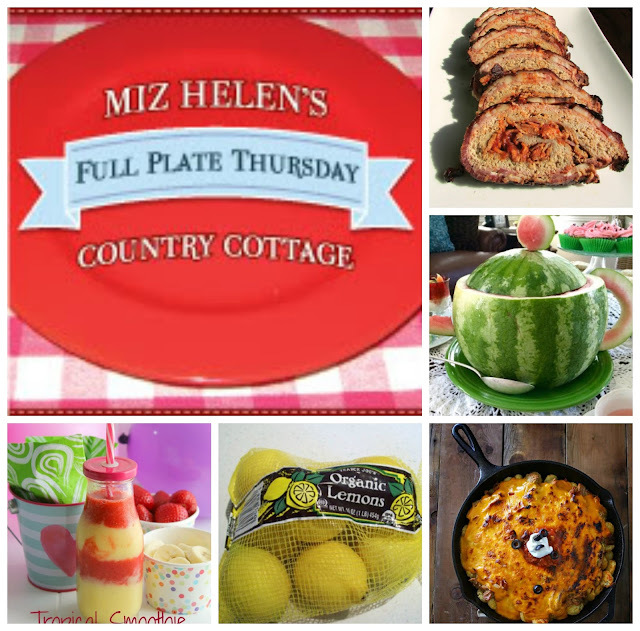 This is our last Thursday of August so we are featuring our Top Ten from Last Week's Party. It is always a fun party to see who you are spending time with. Everyone in this part of the country is sure busy with going back to school activities and just gearing up for fall, we will have a lot to talk about and lots of great food to enjoy today! Loaded Tater Tot Casserole at Kleinworth and Co. Thanks for coming today Easy Peasy Life Matters, it is always good to see you at the party! Thanks for another delicious party Miz Helen! I made a lazy version of your inspiring lemon pie jars last week, I'm sure it's nothing compared to yours, but it is a fast way to satisfy that lemon craving! Your Lemon Jars look amazing, Jenna and I am honored that I inspired you. Thanks for coming, we always enjoy your great recipes! So glad to have you here today and your Collection of Ten Pot Dinners is awesome!Have a great week! Awww Miz Helen, I had to smile when I saw my tea party with my grands, as one of your features. It brought back such sweet memories of them and how excited they were. Thank you for the honor, and for being such a gracious hostess. Your Watermelon Tea Pot is the cutest ever and your Grands are so lucky to have such a special Grandma. So good to see you today! Thanks so much for coming today Pam, it is always enjoy your great recipes! thanks for another great party and that Summer Harvest Bread looks amazing! Thanks so much, we love that recipe for Summer Harvest Bread, hope you get a chance to try it. Thanks for coming today! Oh wow- I'm so honored that you included my tot casserole!! Thank you!!! Hope you have a fabulous weekend! We made your Loaded Tator Tot Casserole the other day and it is fantastic! You have a great weekend, Gina and thanks for coming today! Thanks for hosting! What a great round up of goodies! Thanks for coming today Julie, it always good to see you here with your amazing recipes. Your have a great weekend! Hi Leigh, it sure good to see you here today, I look forward to checking out your awesome recipe. Have a great weekend! I can't wait to check out your Baked Tacos, they look awesome. Thanks for coming today and have a great weekend! Miz Helen, your Summer Harvest Bread looks like something I need to get right on! Thank you for hosting. I know that you will just love the Summer Harvest Bread and sure hope you get a chance to try it. Thanks so much for coming today and you have a great weekend. Thank you for providing a place to get our recipes seen. I am keeping that idea of a watermelon teapot in front of my recipe box. Miss J will be so excited! Enjoy your week! You are just so welcome, Thursday is the highlight of my week when all you wonderful cooks bring your recipes over to share with us. We always look forward to your awesome recipes. Have a great weekend!